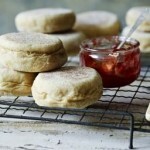 Once you’ve made your own English muffins, you’ll never want to buy them again. Factor in a couple of hours proving time to get Paul Hollywood’s easy version ready to go on the griddle. Tip the flour into a large mixing bowl. Sprinkle the yeast on one side of the flour and the salt into the other side of the flour. Add the sugar, butter, egg and milk, then mix all the ingredients together to form a soft dough. Turn the mixture out of the bowl onto a lightly floured surface and knead for 10 minutes, or until soft, smooth and stretchy. Lightly grease a large bowl with oil. Place the dough in the oiled bowl, cover and leave to prove for at least one hour to double in size. Tip the dough out onto the work surface and roll out to about 1.5cm/¾in thick. Leave to stand on the work surface for 15 minutes, to prevent the muffins from shrinking. Dust two baking trays with half of the semolina or polenta. Using a 9cm/3½oz straight-sided cutter, cut out eight muffins. Place four muffins, evenly spaced apart on each of the dusted baking trays. Dust the remaining semolina or polenta over the top of the muffins. Leave to prove for another 30 minutes. Preheat the hot plate or a heavy-based frying pan on the hob to a very low heat. Griddle the muffins for approximately 5-6 minutes, then flip over and griddle for another 5-6 minutes on the other side.